2018 Xcent’s exterior styling is based on Hyundai’s 2.0 Fluidic Sculpture design philosophy. 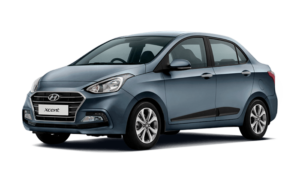 The pre-facelift model was strikingly similar to the Grand i10 sans the boot, but this time around Hyundai designers have really been able to break that perception and come up with a different design.It looks proportionate and cohesive as compared to majority of cars in the segment. The new sedan flaunts signature cascade design front grille with horizontal chrome slats and sweptback headlamps with LED (Daytime Running Lamps) DRLs. The restyled bumper with fog lamps sum up the updates at the front fascia. It rides on dual-tone dimaond cut alloy wheels with first-in-segment Wheel Air Curtains. The side profile remains the same with the Pull type Chrome door handles and ORVMs with turn indicators, while the rear end features new two piece wrap around tail lamps, dual tone bumper, and Shark Fin Antenna (first-in-segment). Step in and the biggest change you will see is in the form of much needed new 7-inch touchscreen infotainment. The unit is also compatible with Android Auto, Apple CarPlay as well as MirrorLink. The user interface is super slick while pairing your smartphones is also easy. The big touchscreen also serves the purpose of displaying visuals for the rear parking camera. As far as cabin goes, it will still remind you the interiors of Grand i10, however, the fit and finish of the dual-toned dashboard, steering wheel, and the controls, all indicate a high-level sophistication applied inside. The air conditioner in the car is still outstanding and the rear half of the car can be quickly cooled with the help of rear AC vents.The back seat comfort remains good with the ample amount of legroom, however, the seat reclining is not as comfortable as it should be. Other feel-good features that remain intact in the car include cooled glovebox, keyless entry, electrically foldable ORVMs, rear center armrest and smart key with engine start/stop button. Powering the Hyundai Xcent are two engine options similar to the Grand i10, a 1.2 litre Kappa petrol unit and a 1.2 litre CRDi diesel. The petrol generates 82 hp of power at 6,000 rpm and 114 Nm of torque at 4,000 rpm. The diesel engine generates 74 hp and 190Nm of torque which kicks in from 1,750 rpm. Both engines have been tuned for the best balance between performance and fuel efficiency.The Hyundai Xcent is available in two transmission options, a manual and an automatic. The automatic is available only for the petrol powered unit in the Kappa S variant. The 5 speed manual gearbox offers smooth gear changes with both engines. The ARAI Certified mileage of the Hyundai Xcent petrol manual is 19.1 kmpl, 16.1 kmpl for the petrol automatic and 24.4 kmpl for the diesel variants. All mileage figures are acceptable by segment standards.Hyundai claims that the new Xcent returns improved mileage figures as the engines have been improved. Where the diesel powered variant delivers ARAI certified mileage of 25.4kmpl, the petrol version, on the other hand, reads 20.14kmpl. The petrol automatic is though, a little low, returning 17.36kmpl. The 2018 Hyundai Xcent comes with improved handling as comapred to its precedessor. The company engineers have worked hard towards the light steering wheel. The power delivery in the diesel variants is smoother due to the new engine. The NVH levels are immensely controlled and one seldom hear a noise even at low speeds. It feels pretty decent behind the steering wheel.The car has also been improved in terms of ride quality and bumps absorption. The suspension set-up is slightly nimbler and the bad patches on the surface are galloped easily. The steering is now lighter to use and more accurate. However, once you go past the 120kmph, one can feel vertical nodding. But that doesn’t make the car feel nervous. 2018 Hyundai Xcent comes with disc brakes at the front and drum brakes at the rear. The company has offered dual front airbags as standard fitment across the entire variant line-up of the new sedan. In addition, several premium features such as Anti-lock Braking System (ABS), Impact Sensing Auto Door Unlock, Keyless entry with Smart Key, Rear Parking Sensors, Rear Camera with display on audio, Central Locking, etc. are available with the top-end variants. Though, it looks bleaker than the preceding model, which had ABS as standard safety feature. Also, the other sedans in the segment come equipped with more safety features than Xcent. The Hyundai Xcent marked the company’s entry into the compact sedan segment in India. Based on the Grand i10, the Hyundai Xcent became popular in its segment, partly due to features like steering mounted audio and Bluetooth controls. Safety features such as ABS and driver airbag being standard across all variants make it an even better option for a small family. The Hyundai Xcent is powered by two engine options, a 1.2 litre Kappa petrol and a 1.2 litre U2 CRDi diesel. The petrol engine generates 81.8 hp of power at 6,000 rpm and 114 Nm of torque at 4,000 rpm and the diesel produces 74 hp at 4,000 rpm and 190 Nm from 1,750 rpm to 2,500 rpm. Both engines, have the right balance between performance and fuel efficiency..